Why would I need self storage in Minneapolis, MN? There are a variety of reasons why you might need self-storage in Minneapolis, MN. How much is a storage unit in Minneapolis, MN? The cheapest storage unit in Minneapolis, MN is $35.00 per month. What size storage units do you have available in Minneapolis, MN? In Minneapolis, MN we have sizes that range from 3'x5' to 10'x30' to suit your storage needs. How much is it for a 3'x5' storage unit in Minneapolis, MN? The cheapest 3'x5' storage unit in Minneapolis, MN is $35.00 per month. 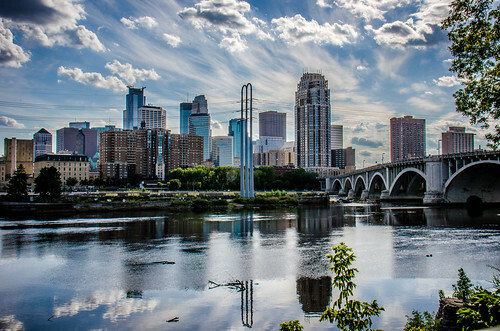 Minneapolis is Minnesota's largest city and among the 100 largest cities in the country. Together with its twin city, St. Paul, Minneapolis is half of one of the largest economies in the entire Midwest. Thanks to this economic success, the city has a high quality of life, with exposure to world-class sports, dining, arts and entertainment venues. The area also boasts clean and safe neighborhoods, many focused on a community-oriented lifestyle. Minneapolis lies on both sides of the Mississippi River and is home to 20 lakes, including Lake Calhoun, which offers a park where you can fish, walk, bike and relax in the summer time. The city also has a host of entertainment options, including professional football, baseball and basketball; galleries and museums; zoos and golf. In the span of just a single day, you can enjoy a range of unique activities, like including boat tours or gaming on a riverboat casino. You can also enjoy a historic tour of the city, sample craft beers at local breweries, or let loose at an amusement park. Many people come to Minneapolis because it has an active economy with plenty of open jobs. The local economy is extremely diversified, with some of its biggest industries including commerce, industry, health care, publishing and education. Dozens of corporations have established satellite offices and headquarters in the city. Among the city's most notable employers are UnitedHealth Group, Ameriprise and Target. You'll find that many businesses call Minneapolis home because of its high level of technological innovation. The city has been named a top tech city in the country, thanks to widely available Wi-Fi, a well-educated workforce and extensive efforts in research and development. As a result, Minneapolis has established itself as a prime location of tech-based companies. If you're looking for a job in technology, you should be able to find a variety of options. The Northeast neighborhood is popular for the city's artist communities and a mix of historic buildings and industrial spaces. Many of the industrial buildings in the area have been transformed into art galleries or private studios. North Loop is a destination for foodies from across the country, and several James Beard Award-winning chefs have establishments in the area. Many of the restaurants in North Loop take a creative approach to the dining experience, and plenty of food trucks can be found lining the neighborhood's streets. Loring Park is home to one of Minneapolis' most famous sculptural works, "Spoonbridge and Cherry." This 7,000-pound sculpture is just one of about 40 works in the local Sculpture Garden, located just across the street from Walker Art Center. World-famous musician Prince lived in the West Broadway neighborhood for some time, which is no surprise considering its vibrant, eclectic feel. According to many stories, Prince did his first solo performance in West Broadway, taking the stage at the Capri Theater. Minneapolis Public Schools manages the local elementary, middle and high public schools. The district also offers specialty programs, charter schools and alternative schooling options. Minneapolis private schools have many different specialized study paths, including faith-based, college prep and fine arts. Minneapolis is home to one of the most popular Big Ten schools, the University of Minnesota. This public university has a wide-variety of four-year degree programs. You'll also find a number of smaller post-secondary schools with a mix of public and private campuses in the area. Utilities: The city of Minneapolis manages public water and sewer services, natural gas is provided by CenterPoint Energy, and Xcel Energy is the main electricity supplier. Transportation: Public transit is widely used in Minneapolis, with bus, light rail and commuter rail service providing easy access. It's also been rated as one of the most pedestrian-friendly cities in the nation. Garbage and Recycling: The city provides regular collection of trash, recyclables and bulk waste, and you can receive credits for participating in the recycling program. The housing market is showing definite signs of strength, with home sales on an upward swing. The median home value is well below that of other large cities like New York and San Francisco, and only fractionally higher than the U.S. average. You'll be able to find a variety of housing options, ranging from modern apartments to charming single-family homes, all for a reasonable price. Our lowest priced units in Minneapolis, MN average $53.80 per month. 499 people have reserved units in Minneapolis, MN in the past 30 days. There are 5 locations within Minneapolis, MN's city limits. There are 4 locations in Minneapolis, MN that offer AC and Heating features.